First published in 2011 by Springer-Verlag is now widely used for teaching around the world. 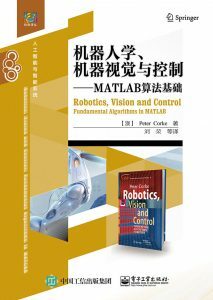 The book has been extensively revised and includes new figures, more consistent notation and new content including: Lie groups, matrix exponentials and twists; inertial navigation; differential drive robots; lattice planners; pose-graph SLAM and map making; restructured material on arm-robot kinematics and dynamics; series-elastic actuators and operational-space control; Lab color spaces; light field cameras; structured light, bundle adjustment and visual odometry; and photometric visual servoing. 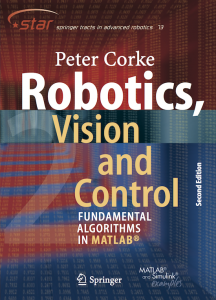 The code examples in this edition are for Robotics Toolbox release 10 (RTB10). The code examples shown in Robot Academy are for RTB9 which is very similar in syntax but there are a few differences. First published by Springer 2011 and now available in various formats. The book had a second printing, with minor revisions, in 2013 (the back of the title page indicates which version you have). The code examples in this edition are for Robotics Toolbox release 9 (RTB9) as are the code examples shown in Robot Academy. Part of the Springer package. If your university subscribes then the book is free to students. This is a print-on-demand version; availability depends on the Springer package your University signed up for. It allows you to buy a black and white paperback copy of the book for 24.99 USD/EUR.